For European banks, it�s a headache that just won�t go away: the 944 billion euros ($1.17 trillion) of non-performing loans that�s weighing down their balance sheets. Economists say the pile of past-due and delinquent debt makes it harder for banks to lend more money, hurting their earnings. European authorities are prodding lenders to sell or wind down non-performing credit, but they�re split on how to tackle the issue, and some investors are disappointed by the pace of progress. There are various ways of calculating soured loans. The European Central Bank advises that non-performing asset indicators should be interpreted with caution because the definition of impaired assets and loss provision differ between countries. The data used below refers to domestic banking groups and standalone banks only, and excludes foreign subsidiaries and controlled branches. �The data for the Czech banking sector consist of the banks that represent only 6 percent of credit extended by the banks operating in the Czech Republic,� the central bank said by email. Here are five charts (above and below) using the ECB data that help explain the non-performing loan issue and how banks are tackling it. 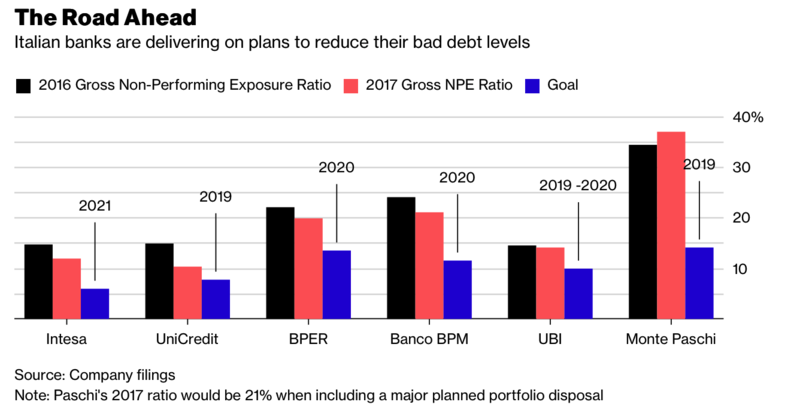 Italian banks have fixed goals for shrinking their bad credit levels by selling portfolios or winding down loans. Intesa Sanpaolo SpA, the country�s biggest bank by market value, got a head start on its rivals two years ago and plans to accelerate the reduction of non-performing loans, Chief Executive Officer Carlo Messina said last month. He says other Italian banks �are doing the right job� and should make further progress this year. Italy amassed its pile of non-performing loans during years of little or no economic growth. The problem is compounded by the country�s legal system, where it takes lenders longer to liquidate collateral than in many other countries. Italy overhauled its bankruptcy rules in October to make them quicker and more efficient. 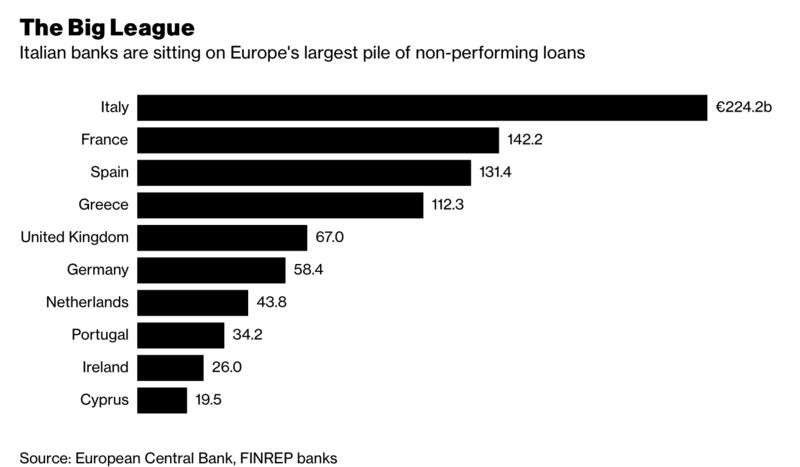 European banks overall have cut their non-performing loans by more than 280 billion euros since the end of 2014. 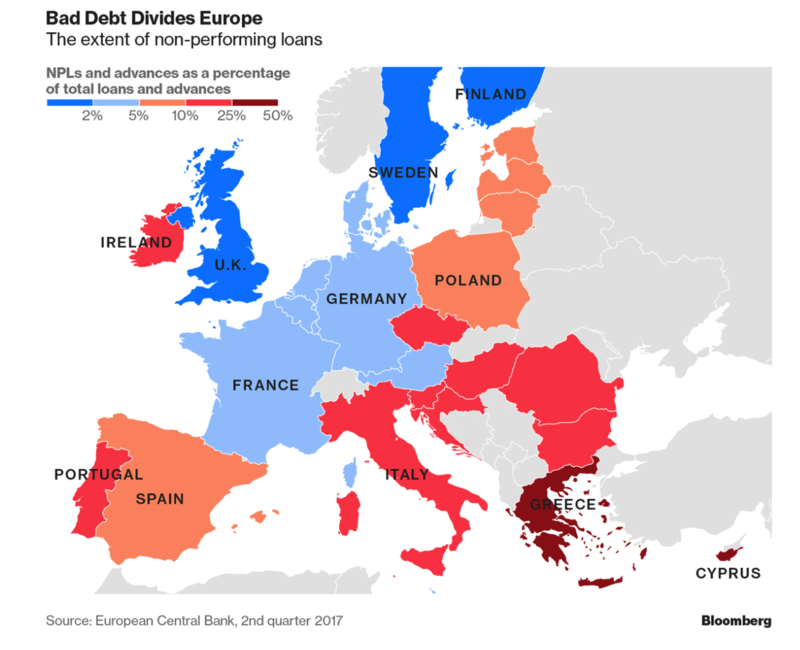 The European Central Bank, which supervises most of the bloc�s big lenders, says bad debt is still �a major problem� which has to be addressed lenders while the economy performs well. The flow of new bad loans is declining in Italy, but the level remains above that seen before the financial crisis. The Bank of Italy says an improvement in the country�s real estate market is helping to reduce the risks for banks. According to the central bank�s most recent financial-stability report, key vulnerability indicators for lenders should continue to decrease over the next few quarters. 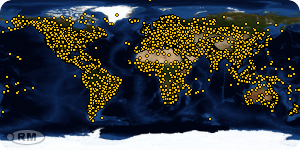 What the five charts don�t show you is how much at risk are the deposits of savers and the capital of small to medium size enterprises (SMEs) who are the backbone of our respective economies. Bank bail-in and bail-in tools are now the preferred option for the ECB when it comes to dealing with failing banks. 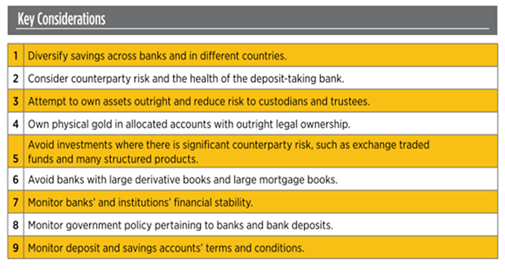 As you can see from the five charts, failing banks in Europe remain a very real risk. In the EU it has been two years since the ECB decided it was better to force the financial burden of banks� failures away from ordinary tax payers and instead onto bondholders and creditors i.e. those with deposits in a bank. Since then there has been very little information from the banks or mainstream media to warn individuals and businesses about the risk their deposits are exposed to and depositors have been lulled into a false sense of security regarding bank bail-ins. Depositors, including savers, should consider diversifying some of their capital and not having all their eggs in the bank deposit basket. 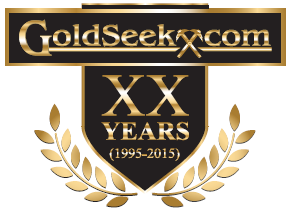 An allocation to physical gold and silver is prudent in this regard. Gold and silver are financial insurance against bank bail-in, political mismanagement, and insolvent banks and governments. Allocated and segregated coins and bars confers outright legal ownership that is difficult to be appropriated, confiscated or subject to �haircuts�. If bullion is owned in the safest ways possible, your precious metal intermediary or counter party cannot claim it is legally theirs and jeopardise your ownership of the asset. Nor can they hamper or remove that all important liquidity and the ability to use your precious metal assets as and when you need to. It has been more than 10 years since the start of the financial crisis and yet banking risks, particularly in Europe, remain very high. The root cause of the problem � too much debt � was not dealt with and as each year goes by it becomes more important than ever to protect yourself from bail-in risks.